Is there anything more tempting than the smell of hot, fresh buttermilk biscuits? Whether you pair them with something savory, like stick-to-your-ribs sausage gravy, or something sweet, like a homemade raspberry jam, nothing says “home” like fresh-from-the-oven buttermilk biscuits. So, let’s celebrate National Buttermilk Biscuit Day this year by mixing up and baking a batch from scratch. It’s quick and easy, and there’s nothing else quite like it. Combine dry ingredients in a large bowl. Cut butter into flour mixture and gently mix by hand until it resembles coarse meal. Do not overmix. 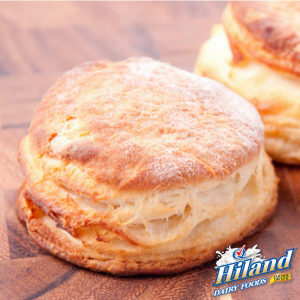 Butter must remain chilled and cannot melt if your biscuits are to come out light and tender. Add buttermilk to mixture and stir with wooden spoon until just combined. Use a 1/4-cup measuring cup to portion and drop biscuits onto baking sheet, 2 inches apart. Bake until golden brown, approximately 10-12 minutes.